A Whole Week of Awesomeness?! After grabbing a quick bite to eat at the 38th St Diner, we were off! We circled back to find this one shop…. And circled over and over again, trying to find it. Instead, we found banks upon banks. M’s a little peeved by then (no worries, we found the store .002 seconds after this photo was taken). Hurrah! Happiness and bead shopping ensued. I decided to make my own bracelet (running-themed, of course). I love bracelets (and rings!) because I lose jewelry easily and these stay on. A lot of bracelets are big for my wrists so I like adjustable ones (or kiddie bracelets, those fit too…err….) This one fits well with a watch-style strap. We headed to pinkberry (M had never been, and I’d only been once, soooo, yes, this was very necessary). Froyo is always necessary between us. Ahh, true friends. They let you take photos of them with food and then post them on the internet. The staff working was so nice and they pretty much bombarded us with samples. I tried the original, strawberry, peach, and caramel…and ended up with caramel, chocolate pretzels, brownie bites, and a wafer cookie. Oh my gaaawsh. Soooo gooood. I really like pinkberry’s yogurt, but it’s kind of pricey compared to the pay-by-weight froyo shops I usually go to. It’s great for a treat, though! I can’t believe they fit all of that into a mini cup! Not bad for my first time decorating with icing! No photos from today, (bad blogger bad? ), but I had a delicious spinach and artichoke slice of pizza. It was my first blogger meetup and a wonderful experience! Refreshing to talk about running, running clothes, desserts and just life for a bit. What a cool, cool experience! I was getting tired. I had passed double digits, there were no more characters on the road, and I was overwhelmed that I had less than a 5k to go. Many, many people were walking at this point, but I kept up a slow jog. I was still feeling good (I had to use my inhaler again around mile 9, right when I passed the Central Florida Accordion Club playing Disney tunes (it’s a real thing). Careful spectators (or Disney workers? There were people with camping chairs cheering runners on, including little kids. High-fiving a little girl lifted my spirits) had placed pine cones in a YOU ROCK formation. Hehe. Mile 11! I was overwhelmed. I’ve always liked the number 11, and I was especially glad to see it here. “I’ll Make a Man Out of You” started playing on repeat in my head…. Right around this point, there was a turn and we headed (slightly) uphill. Now, I go to college next to the mountains, and I didn’t think it was a big deal, but it was definitely an incline and we were all tired at this point. There was an announcer with a video camera and microphone, and as you ran by, he asked you where you were from. It was pretty cool (I said my college town, not my hometown, because I had already heard someone say my hometown). I knew I was going to finish with a smile on my face. I was so, so excited…. I was so tired at this point. I remember passing an older spectator in a wheelchair with a sign that almost made me cry…I just wish I could remember what it said! I was too tired to take a picture…if anyone remembers what it said, it would be awesome! She was after the characters, but before entering Epcot. I see the ball! I was grateful that it was almost over, and was feeling really tired. Chip AND Dale?! Awesome, awesome. I knew the finish line was close and I was excited to run through the World Showcase…or so I thought. I consider myself a Disney enthusiast, but I’m still puzzled as to whose Fairy Godmother this was. The fairy godmother of runners?! Maybe…. 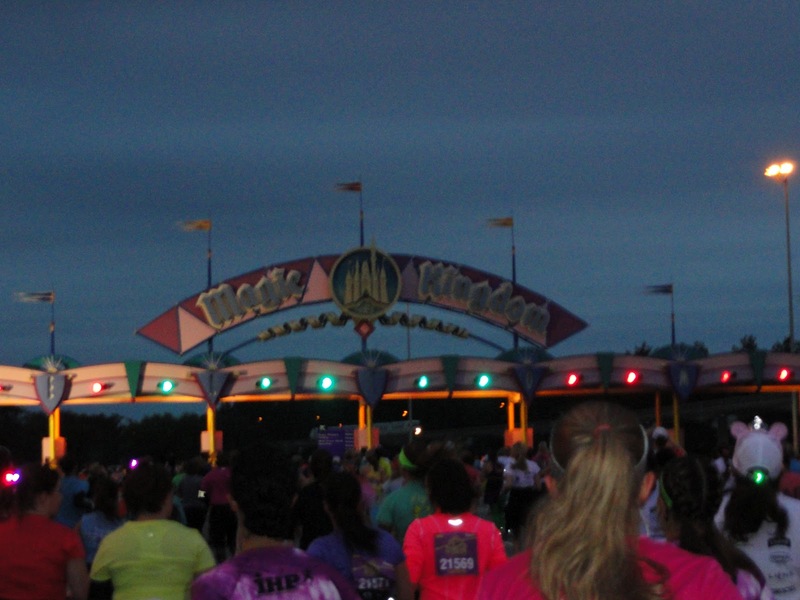 I was really, really looking forward to running through Epcot and finally finishing! Yeah! Just kidding…you don’t really run through Epcot. You just run slightly under the monorail, into a little turnabout, and run right back out the way you came. I was sad (note to self: CAREFULLY READ course description!). It wasn’t a big deal (I had most been looking forward to running through the MK, anyway), but at this point in the race, it was a let-down. I did, however, hear tons of things about the gospel choir that was coming up near mile 13! Right before the gospel choir, it started to drizzle. I whipped out my camera to take a photo of mile marker 13, and my lens got a little foggy. But then I saw the finish! AAAAAAAAAAAAAAAAAAAAAAAAAAAAAAAAAAH! There weren’t too many spectators at this point, but it was still really cool. One of the spectators I saw throughout the race must have been following someone close to my pace, because I saw his just keep swimming sign several times. After I waited for my parents (unfortunately, they got stuck on a monorail when it broke down, and missed me finishing by minutes), we took the bus back to the hotel and showered. I was too revved up to sleep and I was dying to go to the parks to show off my medal. So we headed to Hollywood Studios. On no sleep, pretty much, having been up since three am. Then we went on Star Tours, watched a parade, and I started to have a gigantic headache. It’s hard to fight your body, even if you really want to have fun. We headed back to the hotel for some much-needed snooze time. Then later that night, around 7, we headed back to Hollywood Studios! Even though I know it’s not MGM anymore, sometimes I still call it that…. We rode Toy Story Mania (another great ride! ), Rock ‘n’ Roller Coaster (okay…only I did), The Great Movie Ride, and the Tower of Terror. I had never been on this last one (my mom has been teasing me, saying she’s going to take me on it since I was five). Supernatural things and heights scare me (even though I LOVE roller coasters…go figure), and some people in the lobby were saying it was the scariest ride in Disney and be prepared to be terrified…I was cursing like a sailor the whole time (the elevator was pretty empty), but the drop was really mild! I was pleasantly surprised and I thought the coolest part was when the doors opened and we got to see the whole park lit up at night. My mom thinks it would be cooler during the day, because you can see more, but I always think rides at night tend to have just a little bit more magic. As if I didn’t have enough sugar in my life (true fact: every stomach has a compartment just for dessert. The dessert compartment. This is how I always managed to go, “I’m sooo full,” when I ate real food and still had room for dessert. Now you know! Mmm, ice cream sundae. Delish. We took the bus back to the hotel and I fell asleep quickly. What a magical day. Oh, man. After this series of posts, I’d love to go back to Disney. My roomie plans to run the Tower of Terror 10-Miler in two years, and I think that’s probably the next time I’ll be back. Have you ever been to Disney World? What about Disneyland? I’m a huge fan of thinking about what I’m going to eat after the race to get myself through some tough mileage…do you ever think about food when you run/work out? How do you motivate yourself? This winter has not really been the best for me, health-wise. I posted a while back about being sick and falling behind training, but on top of that, I got sick right after Valentine’s Day and skipped a TON of classes because I was so ill right before the half. I was a nervous wreck I wouldn’t be able to even WALK the thing, let alone run it. Despite everything, I went home a little earlier, slept a ton, and caught a Friday late-night plane to Orlando to race. I had paid the entrance fee, after all. I might as well go to Disney World, one of my favorite places ever. The whole reason I signed up for this race in the first place, to be my first half-marathon, was because 1) I wanted to be a princess 2) Since I never ran the distance before, I wouldn’t be self-conscious about my time, and 3) Running through the Magic Kingdom–can it get any more awesome than that?! So I tried to dispel my worries and went to the Expo (see above). I still wasn’t feeling well simply walking around, and the race was TOMORROW. I was more than a tad worried, and kept praying I would at least be able to walk it and not be picked up by the 16-min-per-mile pacers, something I had NEVER worried about while training. I got some freebies (LUNA bars! Yogurt!) and gear, including an I DID IT! shirt. I was dying to wear it. I knew I had to earn it. I could only hope that I would. 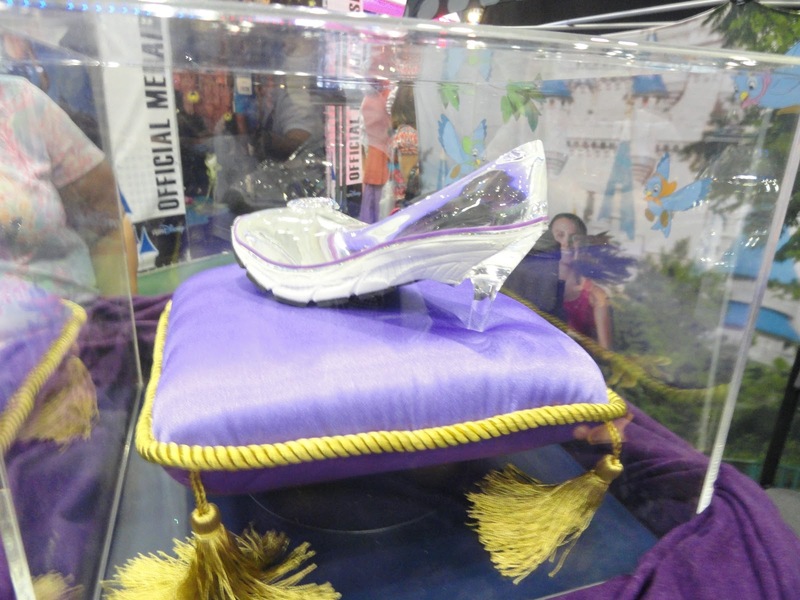 There was even an awesome running “glass slipper” on display. I can only say, wow, Disney is so great with attention to detail…. I had to sit down because I started feeling lightheaded and dizzy. This, in turn, made me freak out even more. And did I mention I still had a DEEP chest cough? Nowhere near ready to run the next day. After a 3:30 pm dinner (I kid you not, I went to bed at 5 pm…but didn’t fall asleep until 7) at the All Star Movies Resort, my parents and I went to bed. I have never, ever been in bed that early before. Even though I was exhausted from the previous week, I tossed and turned (and coughed). I freaked out around ten pm when I woke up coughing. Thank goodness I had my inhaler, and that seemed to help the coughing. With one very early wake-up call, we boarded the buses and headed to the Epcot parking lot! But not without a few fiascos. I have read OVER and OVER not to do anything differently from training on the morning before the race. So I brought peanut butter to eat, and some crackers. Great. It was three am–I forced a spoonful down and had to be satisfied that that was all my body would accept, and I counted on the fact that I had eaten well the day before. Additionally, packing for the race, I planned to wear shorts, a tutu, and a wicking tank top. It was only about 35 degrees out at 3 am, and would be in the 40s to low 50s all day. Tank top? I don’t think so. Luckily, I had thrown in a shirt I had just bought and still had the tags on at the last second into my suitcase. Relieved, I went to put it on…and the security tag was still on. You know, those bulky, ink-filled plastic things cashiers sometimes forget to remove with their handy-dandy machine? Need I remind you, it was three am on the day of the race. I certainly wasn’t going back to the store. Thank goodness that Disney always has places open. My mom ran to the hotel store and they used their machine–backwards–on my shirt, and it came off after a little finagling. If they hadn’t, I would’ve frozen! Now, I had done a lot of reading about what the beginning of this race was like. With about 19,000 runners, most of them women, things can get a little crazy. The lines for the Port-A-Potties appeared ridiculous, but I headed toward the back and only waited two minutes. Aaah, the little things in life. I was still coughing, but not as much. It helped that the weather was warmer. Here I am, all bundled up in my throwaway hoodie (…I still really liked that hoodie, but I was ready to admit it doesn’t fit me anymore). After the LONG walk (it really was about 15-20 minutes) from the Port-A-Potties, backstage, past MORE Port-A-Potties (if they had come to life, the runners would have had absolutely no chance of escaping the Port-A-Potty army), and finally, I arrived at Corral C.
My mom sneaked in and took a pic while I waited nervously for the start. 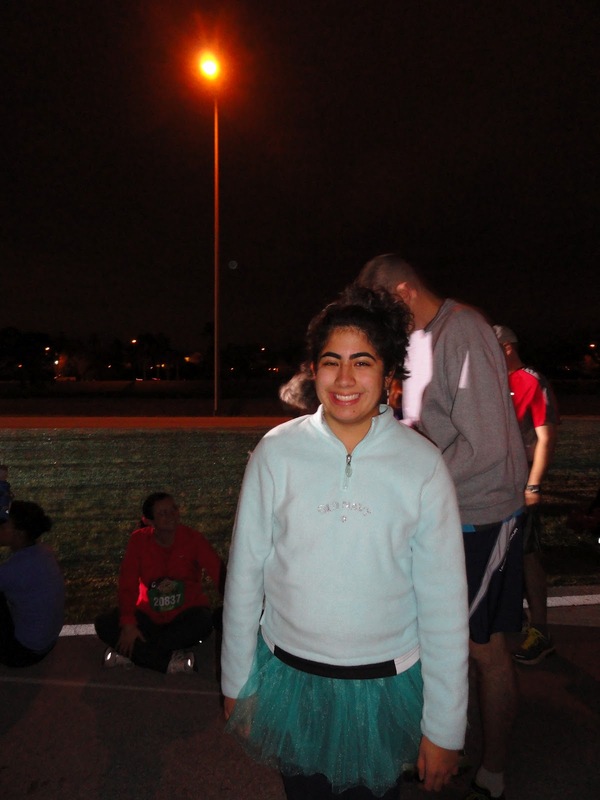 I felt very alone and with a bunch of older runners. 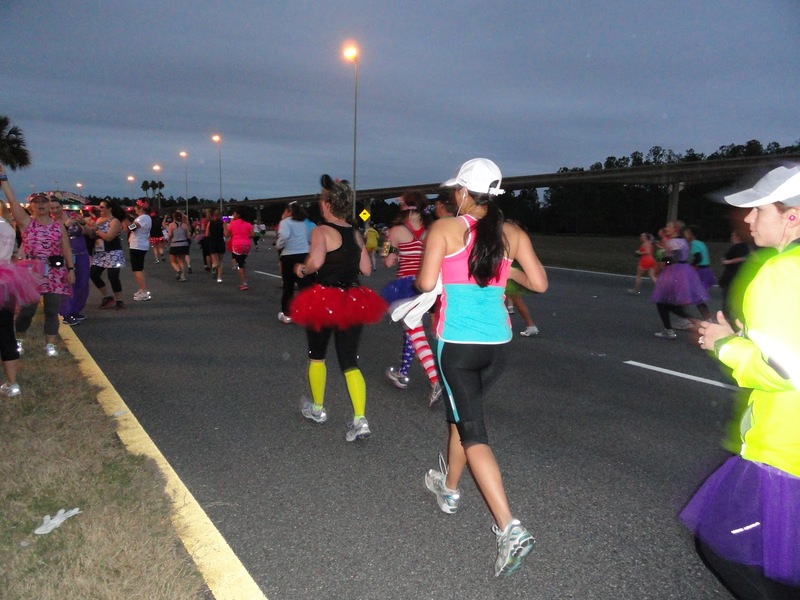 There were, oddly enough, quite a few guys in my area, many running with their own princesses. Awww. I started way too fast. 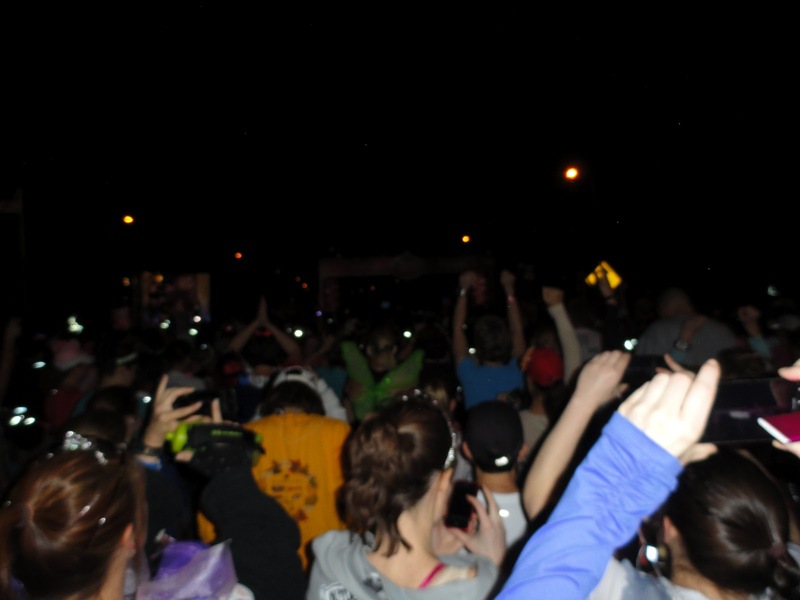 I did my best to keep to the side and let runners pass me, but the crowd swept me up. I think I covered about an 11:40-12:15 mile pace at first. Now, that’s plenty normal for me while I was training, but I kept in mind that I was still sick and I wanted to go as slow as possible in the beginning, at least for the first half of the race. I wanted too badly to finish. I kept coughing. I knew I could only use my inhaler twice during the race, so I wanted to wait and use it sparingly. I was feeling bad at mile 2 and unsure if I would make it. I decided to take a ton of walk breaks and persist with a slow jog. It’s worth mentioning all the mile markers were storybook scenes, and very nicely designed. I enjoyed passing them, and they made each mile more special (after mile 8, every one after that was a new distance PR!). I also decided to keep my hoodie as long as possible (when I’m warm, I cough less). Here’s what began my time lapse. Now, I knew going into this race that I was going to take a ton of pictures (why wear a tutu, after all, if you’re not going to be in photos with it?!). So, I stopped at the first character stop–Jack Sparrow and a giant pirate ship. I waited about ten-fifteen minutes in line, and the photo’s still dark because the sun is still not up (My corral start? Approximately 5:57 am). I also read that this race is all highway. If you are reading this, thinking about doing the Disney Princess Half or the Regular Half, it is! Still, I entertained myself looking at other people’s costumes, and I’m such a huge Disney geek that I loved running behind the scenes, or “backstage,” in Disney lingo. I loved that I have driven this same route a zillion times in my life. This next photo stop was COMPLETELY worth the wait. All the princes? The “smolder” of Flynn Rider? I was so there. Did I really have to keep running after this? That would be running through the Magic Kingdom toll booths. Really. I run through TWO theme parks and pass a ton of awesome characters, and one of my favorite parts was a toll booth? Well, yeah. The operators (I assume?) were out there, directing people and cheering people on. As I passed the speed bump, I thought, I am not a car, and that thought kept me amused for a very long time. Hey, it was only six am, okay? I am easily amused. Unexpected moments during a race can be good (tollbooths! )…or bad (I certainly didn’t expect to be sick). Have you had any unexpected moments in your life lately? Non-running related, I ran into my boyfriend the other day in one of the strangest places in an academic building on campus. Unexpected, but it totally made my day! I’m on spring break right now! Woohoo! If you could take a vacation RIGHT NOW, where would you go?